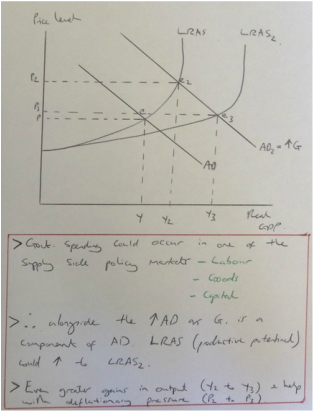 An injection into the circular flow/change in a component of AD will lead to an increase in output/real GDP of Y to Y2. This increase in economic growth will help reduce cyclical unemployment as labour is a derived demand for output, and output has increased from Y to Y2. These two factors will increase confidence of economic agents and lead to rising levels of investment. This multiplier affect will then increase AD and potentially AS in the long run. However as output increases and AD outstrips AS, we start to see pressure on the price level and demand pull inflation of P to P2. Falling unemployment can also put pressure on wages, with the potential for wage price spiral to influence AS negatively through rising costs of production (wages). The possible threat of demand pull and cost push inflation can have negative affects such as creating inflationary noise, uncertainty, fiscal drag, shoe leather and menu costs. As the price level increases then IPC will fall for exports while imports will become relatively cheaper. 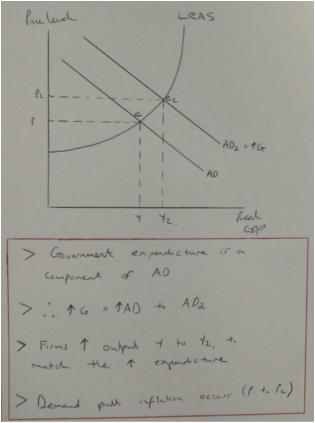 This can have negative affects and see the current account enter a deficit, which is a leakage from the circular flow and leads to the economy growth falling/economy shrinking, depending upon the other components of AD. However if the Government can increase LRAS this will increase the productive potential and the spare capacity this creates within the economy helps create deflationary pressure from P2 to P3. This reduces the associated costs of inflation as well as help maintain IPC of exports. The Government expenditure will lead to significant gains in output as it'll influence AD & AS, leading Y to increase from Y2 to Y3. Further growth can be expected through a multiplier affect as firms respond to this increase in the rate of growth by further investment. This is known as the accelerator. Supply side policies can also tackle problems such as structural unemployment too, which may have persisted in an economy. However the time lag and financial cost can put a strain on the Government budget, as Government expenditure needs to be balanced with tax receipts.